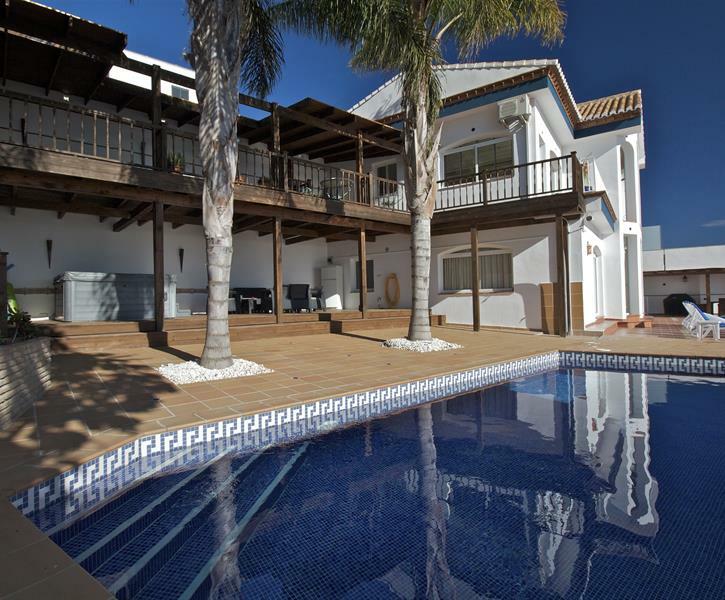 3 bed luxury villa with private heated pool, Jacuzzi, large sun and shaded terraces, WiFi, fantastic uninterrupted sea views and short drive to shops, restaurants and beach. Bedrooms: One bedroom with double bed, bathroom en suite and large glass sliding doors with access to the pool terrace. Another with same kind of sliding doors, two single beds and shared bathroom. The third bedroom are with two single beds. It is a foldable guest bed which can be placed in any bedroom. In the hall outside the bedrooms there is a double sofa bed. Kitchen: Fully equipped. New dish washer and kitchen fan. Ceramic hob, fridge, freezer, microwave, coffee maker, toaster, kettle, hand mixer, hand blender. Separate small laundry room with washing machine, iron and ironing board. Lounge/dining area: Large sofa, new Led TV, bay window with two recliners and a great view. Exit to two small terraces. Staircase down to ground floor. Several TV channels to choose between, CD player, books and board games. Free Wi-Fi. TV-signals quality may vary, due to occasionally internet connection dropouts. General: Linen and towels provided. New garden furniture, gas grill and 6-seater jacuzzi. Villa Licence number: VFT/GR/00615 Complaints form are available in the villa. Stayed at this beautiful house for a week with my boyfriend and 5 friends, first we were blown away by the breath taking view you have from almost every room in the house. But the house is almost as amazing as the view, nice rooms with comfortable beds, 3 big neat bathrooms and a great open kitchen and living area, all of it clean and welcoming. Ground outside area had a great pool, sunbeds for all of us, louge area for siestas and jacuzzi area. Upstairs going out from the kitchen area has a big covered terrace with dinning table and gas BBQ, where we enjoyed most of the evenings. All of these outdoor facilities was nice and clean as well, yet it can get a bit dusty if the wind blows and the two big palmtrees by the pool keept us busy cleaning the water with short intervals, but this was not a problem at all. We spend most of our stay in the house, but going into Salobreña city is not a walking distance as you're on a mountain, but getting a taxi was easy. If you want to go explore the area and or go to the beach then rent a car. We would hapily come back to this house and will highly recommend anyone to rent this house. Enjoy! We were looking for a restful break away from the UK with cooler temperatures: a base for a mix of city/town/village wandering, with a bit of beach time and Sierra Nevada. Also just somewhere enjoyable, down to earth and comfortable. We arrived about 5.30 after a long day travelling and were blown away by the view out over the Med and the property itself. It lived up to the photos and the description very well. It had everything we needed, was well equipped and suited us exactly. We felt right at home straight away. The kids were in hot tub within 45 minutes. We followed shortly after! The tub worked great, lovely and hot. The cover needed a bit of handling to get it off and on as there's no bracket to support it but doable. Swimming pool was lovely. Secluded, sheltered and a good size. Views stunning and a great range of places to sit out and read/chat or just gaze. Also nice that the property is not overlooked. We loved visiting Granada, Nerja, Frigiliana, also Capileira. Favourite beach was Burriana (much nicer than Mari in our view - cleaner and prettier) Lovely sunset watching from Penon de Salobrena and nice food from the restaurant there. Road up to the Villa is a bit winding but light traffic in October. Salobrena doesn't really offer much but the front and the Castillo ok. Lidl not the best supermarket as it's not that big but ok for an initial quick shop. WiFi worked great (multiple phoned and tablets dreaming etc - it's new I think...always a relief! All in all a wonderful stay. Lovely and relaxing. We have stayed in the villa in October 2015.Villa is in the nice development.The views from the villa are beautiful.The two bedrooms have perfect seaview through sliding doors,but the third double bedroom is very dark with no fresh air because the only window from the bedroom is opening to the steps leading upstairs.We were very disappointed with the hot tub.First three days we could not use the hot tub because it kept switching of.It took three days to repair men to arrive to the villa and he told me that only one jet can work at the time because of the power problems with the mains fusebox.Which means only two people could enjoy the hot tub because only half of it was working. .Television was not working for the all our stay at the villa.It was very complicated to reset the satellite receiver.The swimming pool was vey good as well as all the outdoor terraces with amazing view to the sea and mountains.The tennis court in the community area was good only for people who play tennis for fun.If you like to play tennis you can not play there because the surface was terrible bumps and cracks all over the concrete made it impossible to enjoy the game.And I was waiting for my security deposit to be returned to me more than 14 days.